Hip-hip hooray for this adorable top featuring my favorite treat! I picked up this rosé-loving sweatshirt on my weekly trip to Target. You guys - it was waiting for me on the sale rack! It’s full price online, but in store it’s marked half off. (Yes way!) So, I had to! You know the weather is being *extra * because all I want to do is snuggle up in this waffle-knit hoodie. Did you catch last week’s post? Keeping warm and looking cute is easy in a statement top. I got mine in an XS and would say it fits true to size. I can’t tell you the last time I bought a hoodie. While it’s a casual look, this one gave me all the feminine feels, plus it’s ultra soft (go check your Target sale rack this week!) 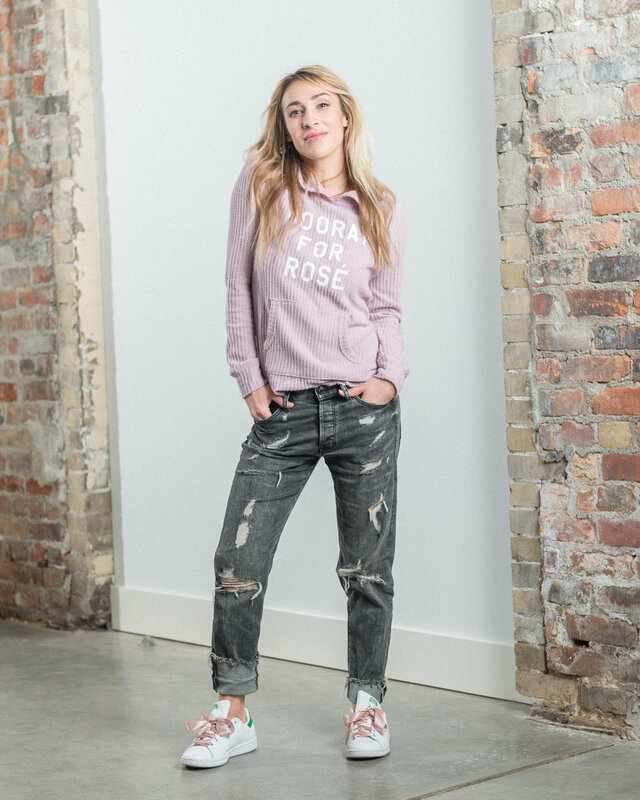 and then stay inside and hide from the cold in your darling top and rosé all day. It's joyous with a cheeky attitude. Coco happened to have on her favorite pink hoodie too and wanted her picture taken, so here we are! She calls that foot kick her "blogger pose." Haha. I was feeling the laid-back look and paired mine with distressed ‘girlfriend’ jeans. The ‘girlfriend’ jean!! I love! They are made to be more flattering than the baggier ‘boyfriend’ jean, which I find harder to style since I am not particularly tall, but still like to achieve that un-done tomboy look. All this talk about rosé is making me thirsty…. I have three words for you: hooray for rosé! Do you guys like rosé? What’s your favorite wine? Red, white, pink, bubbles all of the above?! With Valentines Day three days away it’s the perfect time to pull together your girliest shades of pink for a head to toe pop of wow. Whether you spend the day with a significant other, girlfriends, family, or yourself it’s a great excuse to wear something that makes you feel special and to spread the love. For an intimate yet relaxed look, take a lesson in layering with monochrome pale-rose and butter-soft knits, which always make a chic paring. In this post here I talked about how monochromatic outfitting is an easy way to make a major style statement. If you want to see life through rose -colored lenses, (last seen here) keeping a positive opinion of yourself is a crucial first step. Ever notice how a color can brighten your mood? An optimistic perception begins and ends with you. So you can start by dressing the part. For me, that shade is usually something bright and fun. You ladies know what I am talking about! A fresh mani/pedi, new haircut, maybe even a new shade of lipstick. If you don’t have the cash to spend on the special treatment, do what I did and play around with your look at home. Put on a hat (princess crown) whatever makes you smile. For me, I say give me all the pink, and not just on Valentine’s Day. Positive thinking can be so easily influenced. If all else fails you can come borrow my pink shades, as I’m pretty sure rose-colored life is the best life. “No thanks, I have enough clothes and shoes,” said no woman ever. Shopping for some of us is like oxygen. We need it to live. It’s a way of life. Take us shopping, and we are yours. For others it’s a means to an end. Either way, we all need to wear clothes and have countless options as to where we spend our time and money. While there’s nothing wrong with on-line and retail chain shopping (spoken like a true shopaholic) if you want a catered and joyful experience, look no further than your local shopping boutiques. Since boutiques often evolve out of a founder's passion, they are a great resource for exclusive items. Not to mention, they boost an authentic environment to shop in. Often associated with a specialized service, boutiques offer a wide assortment of their niche product, which in turn allows you more choices. Knowing a shops’ sphere of expertise will allow you to easily navigate what it has to offer. Ragazza, like many boutiques caters to specialized styling, offers great brands and one-of-a-kind finds. Their quality is exquisite and the selection is all-embracing. Boutique shopping is an upgraded experience not only in the la-di-da of discovering a look that no one else will have, but in the luxury of a shopping experience about YOU. Take for example, Ragazza offers private wardrobe appointments, alterations, and a sales team of brand and product experts. Their profuse knowledge of their inventory pretty much guarantees they are equip to help you find an outfit that meets your needs. Now, shopping at an uptown boutique like Ragazza, I expected to find elegant dresses and chic options for weddings, baby showers and business affairs, (see this post here) but what I didn’t expect to find was the same high-end customized fashion in their more casual weekend wear. If there is one fashion item that never fails to call out its wearer as a genuine fashion-girl it’s the jumpsuit. I about died when the styling team at Ragazza pulled this jumper off the rack. It can substitute for a glamed-up gown or be dressed down street-style cool. From off-duty models, fashion editors and movie stars there’s a reason it-girls can’t get enough of this versatile one-piece. It’s the ultimate lazy girl go-to. With this all-in-one ensemble at the heart of your outfit, all you need to think about are shoes, bag, and a few carefully considered accessories. It’s the go-anywhere outfit dreams are made of. Ragazza slayed it. SECRETS OF A FASHION BLOGGER PARTY! A special thank you to Ragazza Boutique for partnering on this post!